Hailed as a Dancer because of her extra ordinary talents in the field of dancing Shrimati Kshetrimayum Ongbi Thouranisabi has also found her place in the World's Famous Book and has been honoured the prestigious Padmashri Award in the field of Dance in the year 2003. She is an astonished dancer in a jiffy without any mechanical aid. This complex dancing has given various enthusiastic dancers a great hope. It can be said that Shrimati Kshetrimayum Ongbi Thouranisabi is blessed with God's gift! 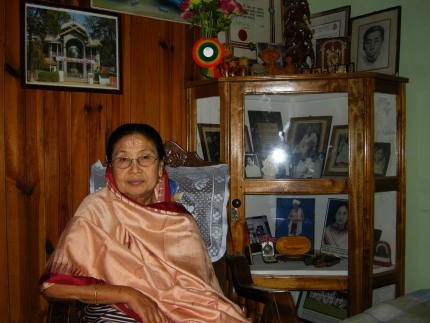 Born on 3rd November, 1946 at Singjamei Sapam Leikai and presently staying at her husband residence at Chingamathak Thokchom Leikai, Imphal, Manipur, Shrimati Thouranisabi is the third daughter of late Shri Leishangthem Tampha Singh and late Shrimati Leishangthem Ongbi Ibetombimacha Devi. Her late father was a famous polo player while her late mother was a well known Nata Sankirtana Singer and associated with late "Maharani Ngambi Devi" a well known Manipur Ras dancer, wife of late "Maharaj Sir Churachand" at "Shree Shree Govindajee Temple". Shrimati Thouranisabi was born with this extraordinary talent as from the very childhood she used to dance orally in no time. Manifested with an extra-ordinary love for dancing at the age of 6, she acted the role of Nityainanda in Goura-leela and she became an expert in complex dancing. At that she had not even got any formal education in dance. On the other hand, her mother who loves the dance and music at that time took her to different places to exhibit her prowess. Soon her reputation spread all over the State and finally her fame crossed the borders of the country. Today, she is acclaimed as an accomplished dancer by one and all. 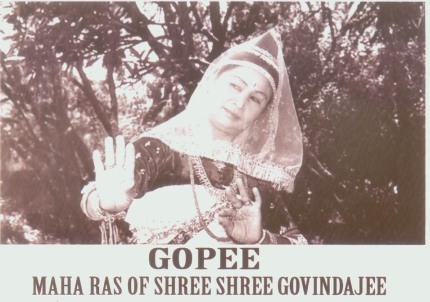 Shrimati Thouranisabi has also acted the role of Rasheshwori (Radha or Thourani) in the Ras Leelas performed in the Shree Shree Govindajee Temple of Manipur from 11 to 19 years and also played the role of Braja Gopee in three Ras Leelas performed in the temple of Shree Shree Govindajee from 20 years of age till now. And she feels that art is not an imitation but it should be contained to a person since the dawn of their life. Thouranisabi who has been acclaimed by the entire country as well as overseas is one of the prominent artistes of Nata Sankirtana and Manipur Dance- rare combinations confine to only few artistes. She is also the writer and director of the ballet (dance drama) "RADHA SATI" the 28th production of Jawaharlal Nehru Manipur Dance Academy, production unit which was staged on 24th December, 2002 and also recorded six gramophone records from HMV, Calcutta. Bishard (diploma) and Achariya (post graduate) in Manipuri Dance from Shree Shree Govindaji Nartanalaya (Govt. of Manipur Dance College) Shrimati Thouranisabi has received training from various outstanding gurus in the field of dance. And for her great contributions in the field of dance she has received several kinds of awards from prominent leaders. Shrimati Thouranisabi has got seven gold medals from the government of Manipur, Tripura, his Highness Maharaja Bodhachandra Singh who was attracted with her elegant dancing and singing as well as from other institutions. She has also received "Royal Robe" from H.H. Late Maharaja Okendrajit Singh and State Kala Akademi Award in Nata Sankirtana (Khubak Ishei) in 1977. Sangeet Natak Academi Award in Manipuri Ras in 1980, Nritya Ratana from Manipuri Sahitya Parishad, Imphal in 1981, Senior Fellow Award in Diva Ras from Department of culture government of India in 1987 also certificate of honour from Chief Minister Manipur in 1991 for contribution to Manipuri Ras Leela. 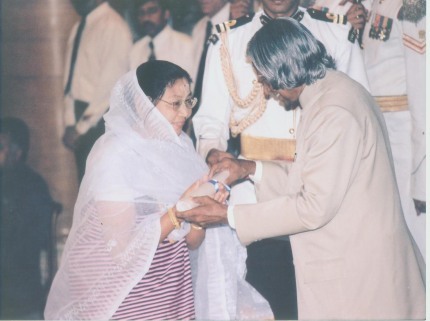 And the prestigious Padmashree Award in 2003. Shrimati Kshetrimayum Ongbi Thouranisabi has been associating with Jawaharlal Nehru Manipur Dance Academy for long time and has given diverse forms of education in the field of dancing and singing to different students. She was working as Senior Guru Rasdhari (deptt. of Ras, JNMDA, Imphal) in the year 1984, Guruhan (Head deptt. of Ras JNMDA) in the year 1993 and Pradhan Guru (Principal) of JNMDA, Imphal in the year 205 and retired on November 2006. And besides dancing she has also produced two books with regard to Manipuri dancing namely "DIVA RAS" (vol. I and II) in the year 1993 which is now a reference book of JNMDA, Imphal and "RAS MAKHAL AMASUNG NUNGI MASAHK" (different forms of Ras and its meaning) containing five like Maha Ras, Diva Ras, Kunja Ras, Nitya Ras and Basanta Ras in the year 2006 and many other books to her credits which will released in very short period of time. Shrimati Thouranisabi has also participated in several major festivals and programmes held inside and outside the country. She had performed 25 shows in Canada, West germany, London, Dubai and USA etc in the 1986 for 2 months and festival of India held at USSR in 1987. She also participated in the major festivals in various places of the country for the last 39 years organized by Sangeet Natak Academy, Deptt. of Culture, State Academies at Agartala, New Delhi, West Bengal, Bombay, Hyderabad, Madras, Assam, etc. Also participated as troop leader OCTAU 2006 celebrating North East held at New Delhi in 2006 which was organized by Department of Culture, Ministry of Tourism and Culture, Government of India. It is obvious from Shrimati Thouranisabi's devotion to dance that she is fully dedicated to her dancing art. She is indeed an ancient ascetic in commune with the divine being. She is a devotee of Lord Govindajee. What she achieved today in the field of music was all blessed by Lord Govindajee as she says. Though she wanted to take her dancing arts to higher and not let it to extinct but it seems that with the coming influence of western culture, the art culture of Manipur has sadly been going down everyday. Shrimati Ksetrimayum Ongbi Thouranisabi has dedicated her life to her dancing. And now she is the guiding light to newcomers in the field. And she has delighted world audiences with her lightning fast computation and her infectious enthusiasm and love for dances and her life is an example in itself of the fact that talent cannot go waste and that even a person with an ordinary background can shine in life. See a gallery containing various profile of Shrimati Ksetrimayum Ongbi Thouranisabi here. * Donny Luwang is a young Manipuri writer / reporter based at Imphal. He contributes regularly to e-pao.net. This article was webcasted at e-pao.net on 24th May 2009.